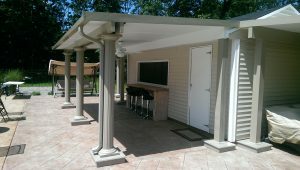 Finding the best patio cover to have installed at your Manahawkin, New Jersey, home may seem like an overwhelming task. After all, you’ll likely want to find a company that installs patio covers that are both stylish and functional, and you’ll want to make sure they have a proven track record of success when it comes to installation. Thankfully, homeowners in Manahawkin, NJ, and surrounding areas can simply turn to SRA Home Products. We have been a leading provider of outdoor living products since 1988, and our commitment to providing top-notch products and services is evidenced in our A+ rating with the Better Business Bureau. Durable – TEMO’s patio covers are made of heavy-duty extruded aluminum for unparalleled strength and durability. Virtually maintenance free – These structures resist rotting, peeling, cracking, and other damage, so you’ll never have to perform extensive maintenance to keep your patio cover looking its best. Stylish – Our patio covers feature gorgeous Mediterranean-inspired column designs for a stunning look. Comfortable – These structures also boast solid thermal roofs that deflect the sun’s heat, providing both protection and comfort for you and your family. As if all this wasn’t enough, the patio covers we install are backed by TEMO’s limited lifetime transferrable warranty, so you can feel good knowing your investment will remain protected for years to come. To learn how to have the experts at SRA Home Products install a patio cover at your home, contact us today. A member of our team will gladly schedule a free consultation at your Manahawkin, NJ, home.